Anurag Basu wanted to make a musical and he made it. But the amazing fact is that he decided to make a musical out of a detective narrative. “Jagga Jasoos” is one of the smartest Hindi movies of recent time, which bypasses the fence of typical stereotypes of filmmaking approaches in bollywood and is a delight to watch. Jagga – a shy young boy, is reluctant to express his feelings verbally, as he stammers. But one day his father ( Saswata Chatterjee) advices him to prolong his technique of speaking by singing his thoughts. So Jagga starts singing while expressing his thoughts using the emotional quotient of mind controlled by the right portion of the brain (as it says). But one day, his father disappears in the midst of a conspiracy and for years, Jagga is clueless about the whereabouts of his father except a video tape he receives from him once a year on his birthday. Jagga grows up (Ranbir Kappor) and his quest for his father begins and continues through an adventurous and intriguing narrative . In his journey, Jagga meets Shruti ( Katrina Kaif) and the narrative unfolds in different dramatic but interesting sequences till it reaches the climax. In Bollywood, when we think about a complete filmmaker, we visualize Aamir Khan. But when we talk about a complete actor, it’s none other than Ranbir Kapoor. The character of Jagga passes through numerous shades and Ranbir is just outstanding throughout. The director, Anurag Basu, who worked with Ranbir in “Barfi” before, exploits his cerebral acting skills by using numerous close shots to capture his changing expressions in different scenes. “Jagga Jasoos” is one of the best performances of his life and in Bollywood only he could do justice to a character like this. The director exploits the beauty and charm of Katrina Kaif in a masterly manner to cover up her limited acting skills, which exposes few times before the power-pact performance of Ranbir Kapoor. Saswata Chatterjee and Saurabh Shukla also live up to the expectation and give flawless performances. 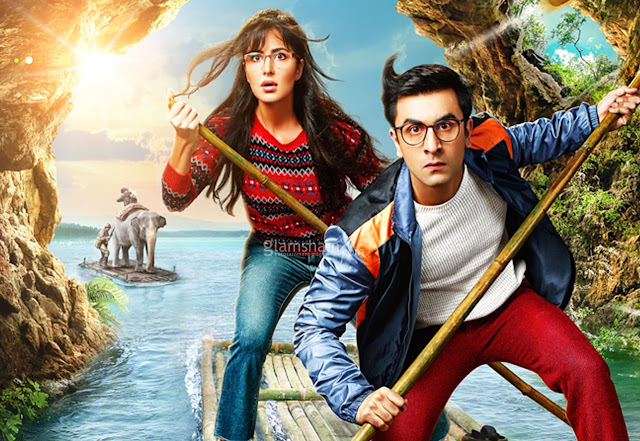 “Jagga Jasoos” is a musical with a younger target audience and Pritam Chakraborty composes a few brilliant tunes which are just appropriate to the shades of the storyline. “Ullu Ka Pattha” , “Khana Khake” are few of the foot-tapping scores used in the movie. Arijit Singh does the bulk of singing and he is well supported by Nikhita Ghandhi, Antara Mitra and others. It has been refreshing to listen “Wada Raha” famed Arnab Chakraborty after a gap of few years in Hindi movie, in the song “Chocolatey Chunnu”, which he renders beautifully. All the songs are perfectly penned by Amitabh Bhattacharya. “Jagga Jassos” is a musical with many dance sequences, masterly crafted and choreographed by Shiamak Davar and his team. Cinematography of Ravi Varman is outstanding and with the slick editing of Ajay Sharma it has become a visual treat. Anurag Basu is one of the best directors in present Bollywood and he has painted his passion on silver screen through “Jagga Jasoos”. But sometimes, the passionate thoughts of the director overshadow the cerebral film making approach and add up few excesses in the movie. Furthermore, a few animation sequences are poorly derived, a casei which would not be expected from a bigger production house, like Disney. But as a musical with younger target audiences in mind, “Jagga Jasoos” lives up to the expectations and ends up as a visual treat through a brilliant performance of the protagonist.